There is something that is just so comforting about meatloaf, but I will admit that it's something I rarely make, though I'm looking to remedy that. Since I cook for two, and honestly we're HORRIBLE about using up leftovers, it's kind of hard to make meatloaf. With that being said, I have been playing around with finding a great mini-meatloaf recipe because they're perfect for cooking for two. 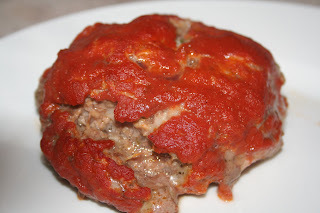 There are many variations of meatloaf, but I found that this one is a winner for our house. Preheat oven to 400 degrees. In a saute pan, heat tablespoon olive oil over medium heat. Add garlic and onion and sautee until soft. Remove from pan to cool. Once onion and garlic has cooled, mix together with all other ingredients, except sauce, in a large bowl and combine until just uniform. Shape mixture in to 4 mini oblong loaves and place on a foil lined baking sheet. Spoon a few tablespoons - 1/4 cup of the sauce over the top of each loaf, depending on how much glaze you like! Bake for 25 - 30 minutes, until the center reaches 160 degrees.